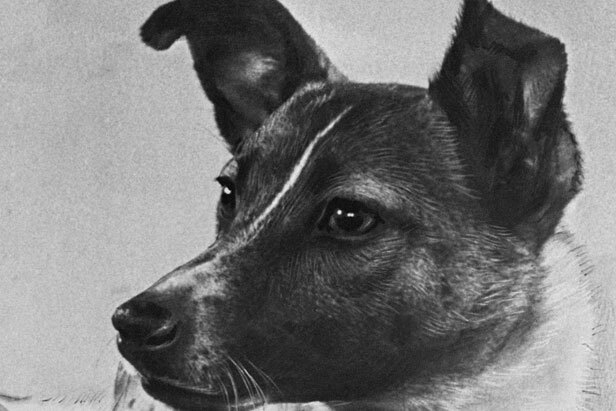 The dog Laika was the first animal to enter the earth orbit. Her unlucky fate inspired artists around the world. On the 3rd of November 1957 the Soviet Union launched a space capsule with the dog Laika on board. She was the first animal to enter orbit around the earth. The experiment proved that a living being was able to survive a space launch and zero gravity, which opened the door to manned space flights. Laika herself, though, died on board 5-7 hours after the launch due to overheating. Her death caused global outrage. The Kremlin was accused of animal cruelty. Laika's fate inspired artists, film-makers and musicians around the world. Many of their works suggested a happy end instead. Move the cursor over ( or tap) the picture, click (or tap) pins to explore the works.